After these joseki plays, Black will play the atari moves at a and b - in some order. Which is correct? 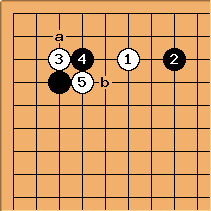 If Black gets the timing wrong, as here, White can exploit the presence of to make a net on the outside with . Now is misplaced. 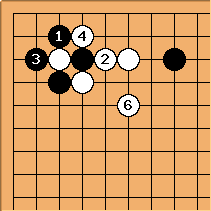 We assume that Black connects the ko, since there are no ko threats in the opening. Black should play the other atari first. 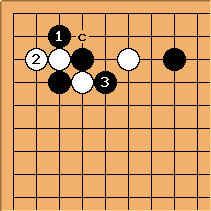 In this case White's chance at resistance with c next gives Black an outside ponnuki. White cannot get a good result that way. If White tries to resist in the same way as before, the result she gets is much worse. 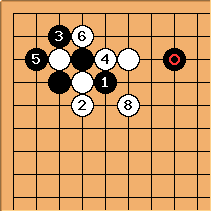 Go is ruled by minimal play – play something only because it is required – so timing is 'recognition of necessary plays'. According to this, 'urgent points before big points' is the master proverb. You could also say that the middle game is typically a time of concurrent fights, so that good timing equates with strength. The idea of a probing type of strategy is to get commitment from the opponent first; and then decide timing and choice of direction. On the other hand reverse sente is a weapon of strong players. Timing is required to play kikashi. Theoretically speaking, perhaps the game divides up as game temperature model, plus real timing issues which aren't just a question of sente sidetracks.